I’ve moved to Madrid! Or more accurately, I am writing this while hovering 30,000 ft somewhere above France, in the plane en route to Madrid, at 1pm on the day of the big move. Technically speaking I am mid-move. I’ve been anticipating this day since Spring 2012, when I discovered I’d been accepted onto my two-year graduate scheme, which incorporates a 6-month work placement abroad somewhere in Europe or even in Latin America. It’s been on my mind ever since and I always knew I wanted to return to Spain, a country I fell in love with during my Erasmus semester studying in Córdoba in 2010-11 – a shocking 3 years ago. How time does fly. A lot has changed since I last lived in Spain: I’ve graduated from university and left my student life behind, I now work and am firmly on the career ladder. I now write a travel blog open to the entire world, whereas I used to jot down my thoughts in a private diary with old-fashioned pen and paper when I last lived in Spain. Córdoba is a very relaxed and tranquil city in the heart of traditional Andalucía, whereas I’m now going to live in Madrid, a much more cosmopolitan and busy hub of activity and life. I’m also 3 years older and have experienced so much since then, moving first to Italy, then back to university in Exeter and lastly living in London, a city I adore, for the last 18 months. I am certainly going to miss London, and it definitely felt strange to officially move out of my flat in Parson’s Green, a little neighbourhood that feels so homely and familiar, despite it happening to be in the centre of a hectic 8-million-strong city such as London. I have adored London but the pace has been somewhat exhausting at times! Every month I promise myself I’ll take a rest, but somehow I have ploughed on at top speed for the last year and a half (here’s an example: Postcard of the Week: “Live every day as if it is your birthday”), and I’ve loved every moment, but in some ways I feel I need this short 6-month break to stop myself being swallowed up by London. There are lots of things I want to do once I get to Madrid but so far I’ve tried to keep my diary relatively empty so I can pick and choose, although I do already have a few trips booked over the coming months: to Padua in Italy, a weekend visiting friends in Paris, skiing in the Alps and even to Bali and Hong Kong! Recently I’ve been so caught up in “the big move” and everything that entails, and I feel this time around it has been more complicated than when I last moved to Spain. As a student I was so mobile and independent, and I could flit around the world almost whenever I pleased, with few ties and much more flexibility. Now that I’m working I am, technically speaking, more independent than I was as an impoverished student, as I now earn my own living and I am entirely self-sufficient. But in other ways I have lost some of my independence, for example limiting myself to 31.5 days a year of annual leave, and depending on my job to pay my rent and survive. 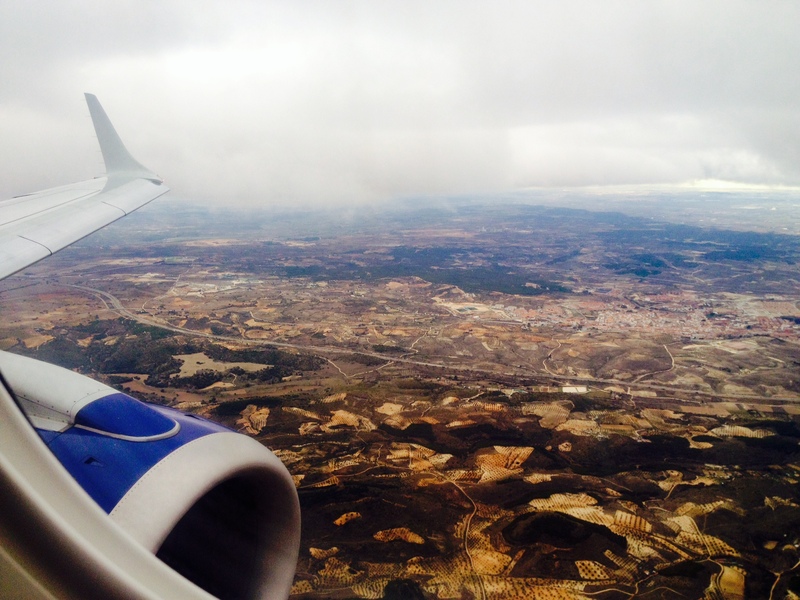 I made this transition from student to graduate 18 months ago, and I wrote about it at the time in my blog post ‘Coming to terms with the concept of “Annual Leave”‘ but moving back to Spain has somehow brought it back to the forefront of my mind once again. I’m excited about the change of scenery that awaits me when this plane lands, and about the challenge of starting a new job in a new team in just 3 days’ time. I’m so lucky to even have this opportunity to move abroad with work, and I know lots of fellow language graduates are desperate to do the same, and make use of the language skills they studied so hard to obtain. I toyed with the idea of writing my blog in Spanish for the next six months, but thought that might be a bit cruel for those of you who don’t speak Spanish! I can’t wait to properly explore Madrid and make it my new home – watch this space! As selfish as this sounds I appreciate you choosing not to start writing your posts entirely in spanish lol. The only word I know I have is “hola” aside from that I’m completely hopeless! Hahaha it would be a great way to use my Spanish but probably quite unpopular with everyone else! If I had more time I might set up another blog in Spanish, but I know I’ll never get round to that! Thanks and I’m sure it will be! Great blog – interesting about the paradox of freedom and independence. Thank you! I can’t wait to get to know it! Thanks Kirsten! Shame I won’t be seeing you in London over the next few months but will be writing about Madrid very shortly and see you once I’m back!